I love greens. Love. In high school, I would eat them for a snack when I got home from soccer practice. When I left for college, I took cans of Sunshine Turnip Greens with me to school because I was afraid that I wouldn’t be able to find them (I went to college in the south, so this was a bit ridiculous but I couldn’t be sure until I got there and I wasn’t willing to risk it). Eventually, Sunshine changed their recipe and I was left having to face the unthinkable – making them from scratch. I remember my mom telling horror stories about cleaning turnips and collards and having to employ the use of the washing machine (has anyone done this?). In fact, I vaguely recall this actually happening at home but it may have been after the older siblings left for school. Can anyone related to me corroborate this? Traditionally, collards and pork are a match made in heaven but there are times when I deviate from the norm. My favorite recipe for collards or turnips is based on those served at Taqueria del Sol in Atlanta. They’re hot and spicy and brothy with bits of tomatoes and onions and still pair really well with New Year’s day staples like black eyed peas (some traditions I’m not willing to mess with). I got three huge bunches of organic collards at the farmers market for two bucks and with the help of the sous chef, we made pretty light work of the prep. They’re definitely not as difficult to manage as legend would have you believe and these were actually pretty clean, even before the sink-soak. *I marked this as vegetarian and can be if you use vegetable stock instead of chicken stock – you know the drill. 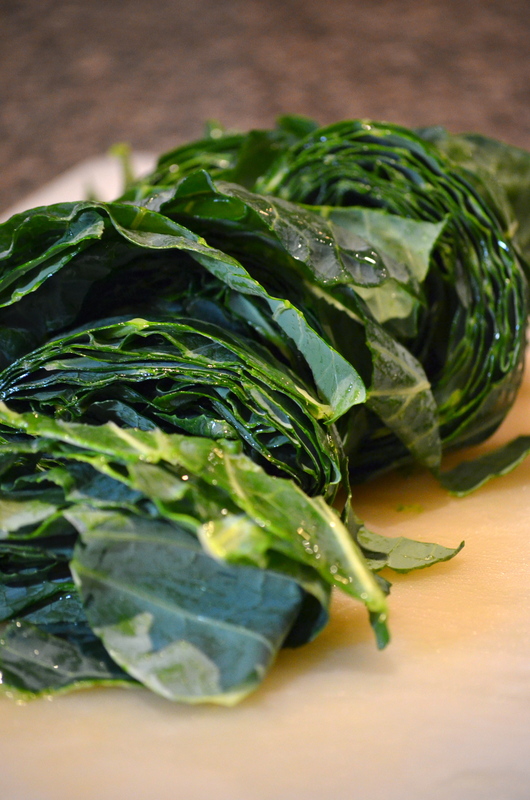 As you can imagine, the most time consuming part of this recipe is the collard-cleaning, but since you’re probably recovering from an exciting new year’s eve, then a mindless task like this should be right in your wheelhouse. 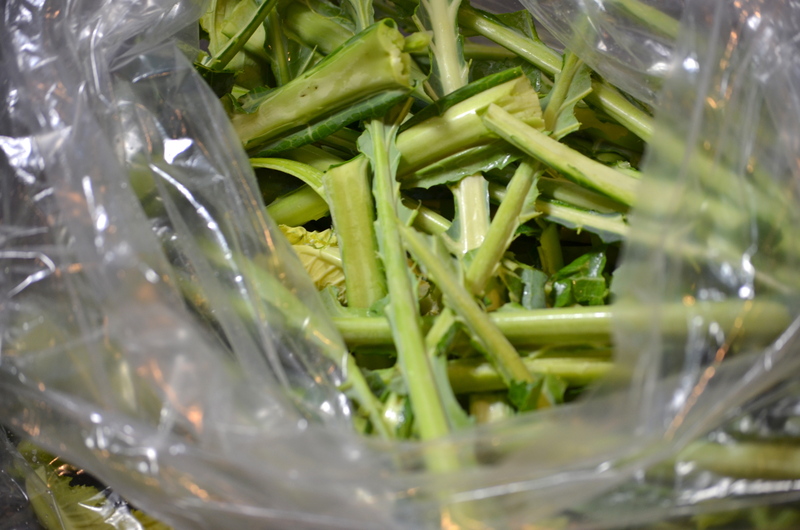 Pull the leaves from the woody stems and get them ready for their bath. 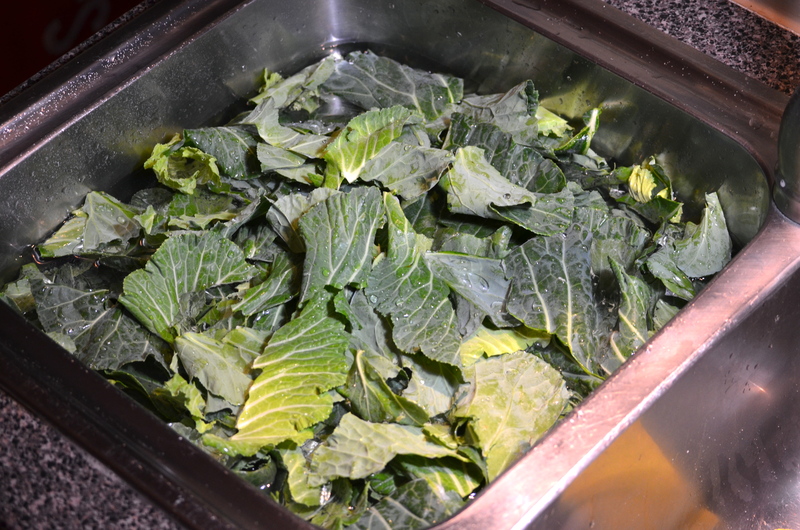 Fill up a clean sink with cold water and let the leaves hang out in there for a few minutes while you prep the rest of the ingredients for the greens. 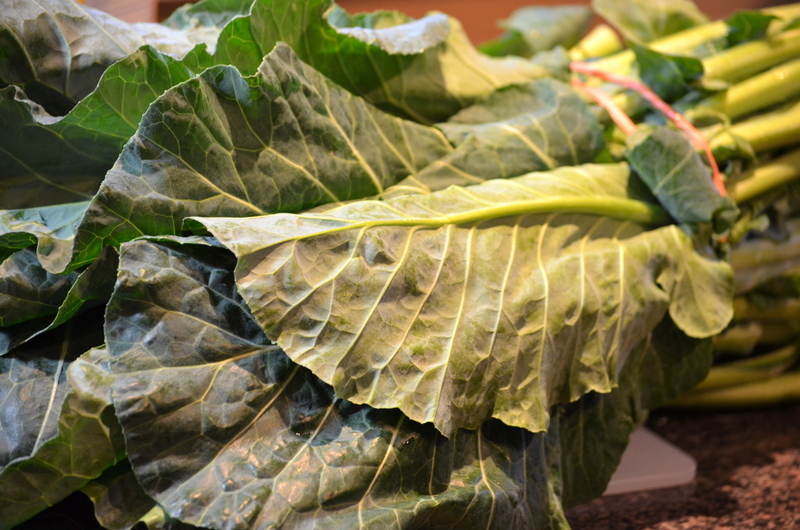 The dirt should fall to the bottom and you’ll have squeaky clean collards ready for cooking in no time. 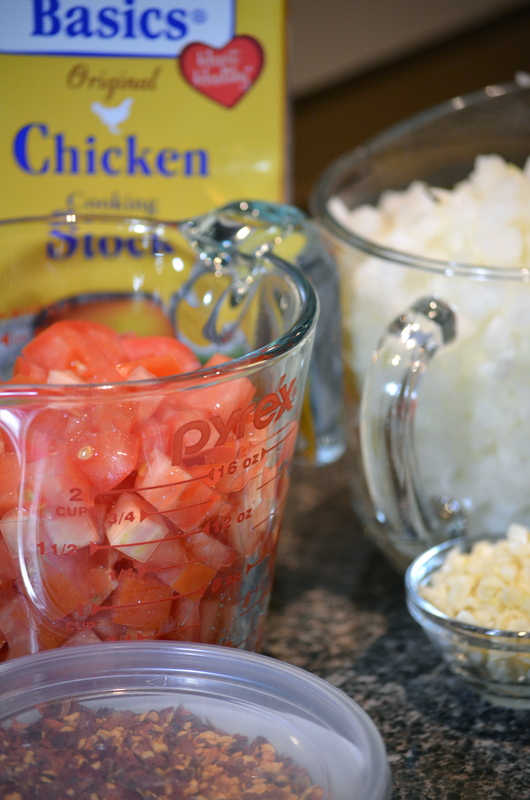 Meanwhile, dice your onions and tomatoes and get your garlic situated. 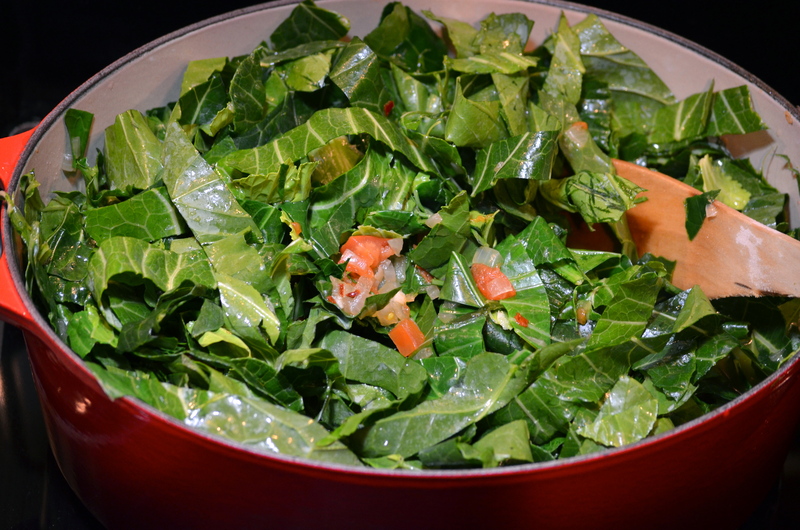 Drain the water from your collards and chop those up. I treat the leaves like giant basil and basically chiffonade them in the same way. Gather a handful of leaves and roll them up like a collard cigar and cut them across into big strips. Grab a very large pot and heat some olive oil over medium heat. 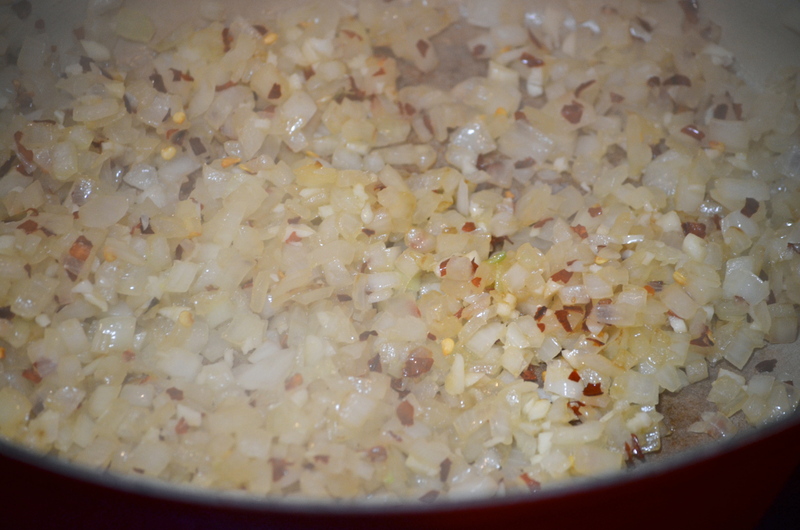 Add the onions and saute until translucent and beginning to brown for about 8 minutes. Then add in the garlic and chili de arbol or red pepper flakes and cook for a minute. 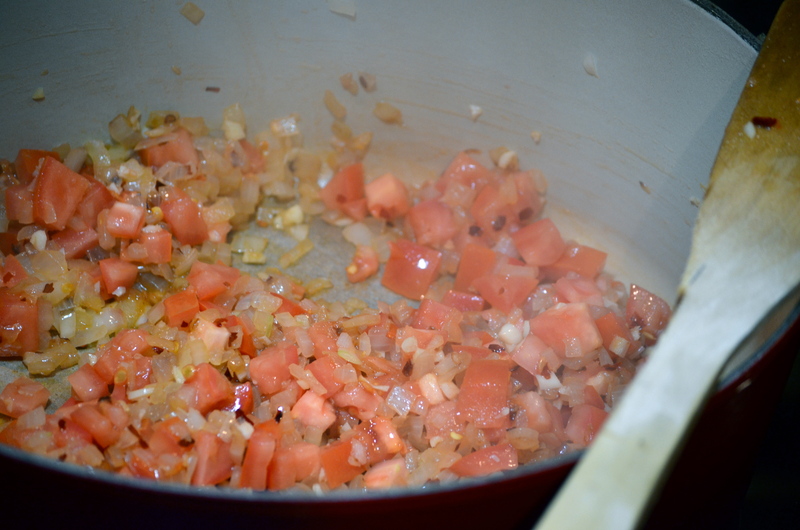 Add now add your diced tomatoes and cook for one more minute. 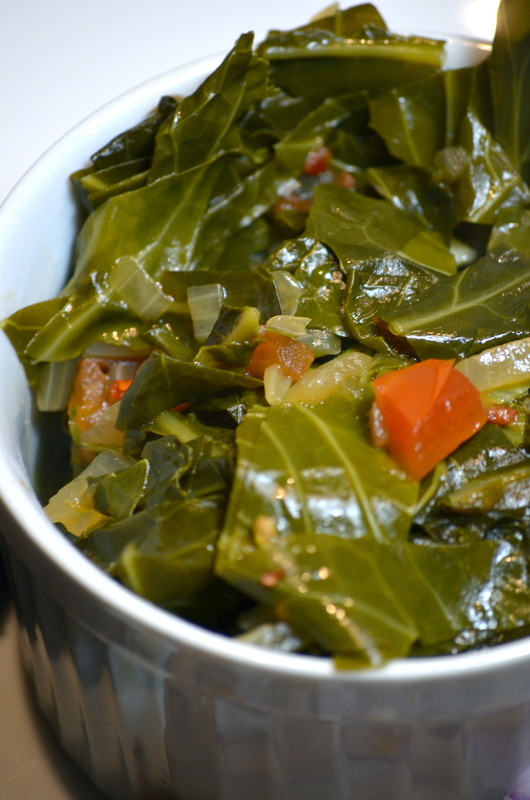 Now you can add in the chopped collards and the chicken stock. 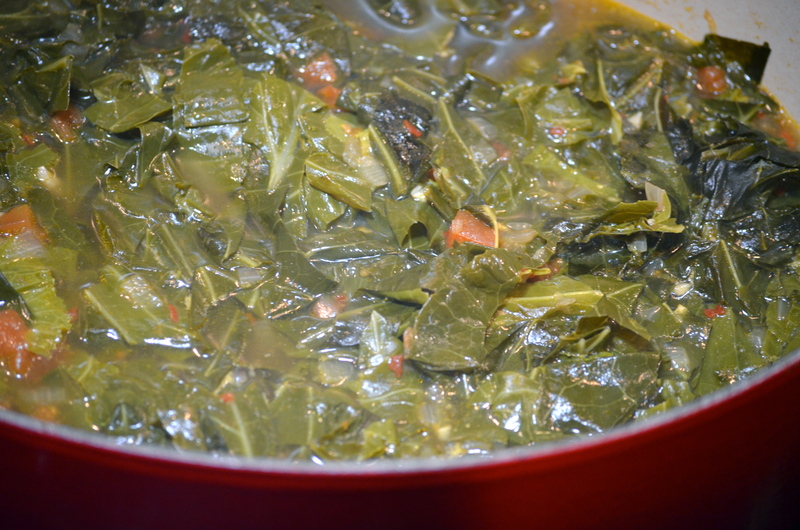 If you need to add a bit more water to the pot so the collards have enough liquid to cook in, go right ahead. Add at least a teaspoon of kosher salt (you’ll probably need more). Like I said, we had these last night with a pork tenderloin and some black eyed peas just so we have all our good luck bases covered for the year. I have a feeling if you didn’t get around to this yesterday that it’s probably ok to add them to tonight’s dinner. Or come over – I have leftovers and would be happy to share. I have no recollection of an appliance being employed to wash greens.